Situated less than one mile from the center of Provincetown and boasting private beach access the waterfront non-smoking Surfside Hotel and Suites features free Wi-Fi breakfast service and comfy accommodations. Spanning four stories and featuring exterior corridors and 83 rooms the non-smoking Surfside Hotel and Suites offers standard in-room amenities such as cable TV mini-fridges coffeemakers microwaves and hairdryers. Complimentary Wi-Fi service is available in the lobby. Guests can start each morning with continental breakfast selections including waffles eggs and bagels. The private beach are the perfect places to enjoy a summer Provincetown day. The inn also features an on-site lounge and business center. 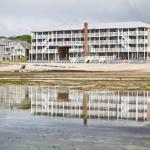 The waterfront Surfside Hotel and Suites in Provincetown is within a short walk to Provincetown Theatre Provincetown Art Association and Museum and Pilgrim Monument. Boston ferry service is one mile from the inn while the Highland Museum and Lighthouse is a 15-minute drive away. Logan International Airport is 117 miles from the property.